Non-profit group, Ithaca is Love, in conjunction with local organizations, to distribute decals to select Tompkins County businesses. 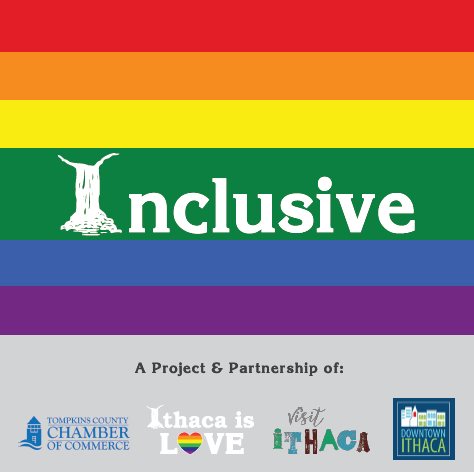 Local non-profit group, Ithaca is Love, will begin distributing “Inclusive Space” decals to local businesses this June in honor of Pride Month. Ithaca is Love worked with the Tompkins County Chamber of Commerce, The Downtown Ithaca Alliance, and the Ithaca & Tompkins County Convention & Visitor’s Bureau, to create, and ultimately distribute, window decals for local businesses that wish to advertise that they are an inclusive space for members of the LGBTQIA+ community. In appreciation of their demonstrated support of Ithaca is Love and the LGBTQIA+ community, Moonies Bar and Nightclub, K-House Karaoke Lounge and Suites, Silky Jones, and The Range, will be the first recipients of the “Inclusive Space” decals. Local businesses that wish to commit to being inclusive spaces, and would like to request one of these decals, can email ithacaislove@gmail.com. To stay up-to-date on initiatives and events put together by Ithaca is Love, follow their Facebook page by searching “Ithaca Is Love” on Facebook. Due to an overwhelming show of support at Ithaca is Love’s last karaoke night, the next Ithaca is Love event will be a Pride Karaoke Night at K-House Karaoke Lounge & Suites on June 15th. The pride nights at K-House will now be a monthly event, taking place the third Thursday of each month. Ithaca is Love thanks everyone for making these events such a success! Join now by clicking here! Ithaca is Love is a non-profit organization located in Ithaca, New York, that works to coordinate social events and create a sense of community for the LGBTQIA+ community members and allies, living in the Ithaca area. Ithaca is Love received 501(c)(3) status through Cornell’s Center of Transformative Action. The Ithaca Is Love group formed after creating an event to show solidarity with the victims of the Orlando Mass Shooting in 2016. The event, which featured community members wearing varied colors of “Ithaca is Love” shirts and forming a human rainbow on the Ithaca Commons, received overwhelming support. Over 300 t-shirts were sold out in less than 40 minutes, and the Ithaca Commons was flooded with supporters. This outpouring from the community showed a need for LGBTQIA+ events in Ithaca, and “Ithaca is Love” works to fill that void. The group looks forward to continuing to create events that celebrate the LGBTQIA+ community and our allies in Tompkins County.